In many cities around the world, patrons of high-end restaurants want quality food that is flavorful and fresh. To satisfy their guests, chefs are looking closer and closer to home – to locally grown produce from neighboring farms or even from their own, restaurant-owned gardens. "You can't find fresher food anywhere," says Sam Wortman, assistant professor at University of Illinois at Urbana-Champaign. "Chefs are literally picking produce the same day they're cooking it in the restaurants." As the concept of local food and urban gardening gains popularity, urban agriculture, with its benefits and obstacles, is coming to many cities. The issues surrounding food production in urban areas are outlined in a paper recently published by Wortman and Sarah Taylor Lovell in the September-October issue of Journal of Environmental Quality. The benefits of urban agriculture are many. Urban gardens are often built on previously unused lots, increasing the beauty and value of the neighborhood. They provide recreation opportunities and a social network for the gardeners involved. Urban food production also means that healthy, fresh produce is readily available to city dwellers. In light of the benefits, urban gardens are popping up across the nation. But the challenges that organizers and growers face must be understood and addressed if urban gardens are to become widespread and even profitable. Several obstacles face planners and growers including soil contaminants, water availability, and changes in climate and atmospheric conditions. Several contaminants can be found in urban soils, and lead is the most prevalent. While there is concern about plants taking up lead from soils, research suggests that they actually take up very little. "Even in roots, there is still a relatively small amount of lead compared to, for example, what we're exposed to from drinking water," says Wortman. Direct ingestion of soil containing lead is a bigger threat than plant uptake. Soils can be directly ingested when children play in and eat soil, soil adheres to crops after they're harvested, or soil particles blow in the air. Practices such as washing food well before eating and covering soils with mulch can help decrease these risks. Finding reliable and safe water sources can be difficult for urban farmers. Technologies such as drip irrigation that precisely deliver water where and when it's needed can help conserve water. Reusing rainwater and wastewater can provide additional water, but those sources must be monitored for contaminants, and perhaps treated. 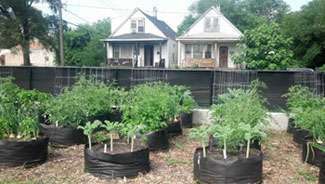 Changes in atmospheric and climate conditions in cities compared to rural areas can also be obstacles for urban growers. For example, temperatures and vapor pressure deficits (the difference between saturated and actual vapor pressure at a specific temperature) are often higher in cities. Extreme temperatures during the day and higher nighttime temperatures can inhibit photosynthesis in plants and decrease yields. Likewise, when vapor pressure deficits are higher, plants have to use more water creating moisture stress and reducing photosynthesis. To better understand the effects of varying climates and atmospheric states on food production, Wortman and his colleagues have a project underway. They are looking at six sites on a gradient from downtown Chicago to 40 miles west of the city. The sites all have the same, ideal soil conditions allowing the researchers to take soil factors out of the equation. "We are trying to isolate the effects of the atmosphere," explains Wortman. "We are monitoring concentrations of carbon dioxide, ozone, temperature, humidity, wind, and other factors across all of the sites." The study is still ongoing, but Wortman says the preliminary results are exciting. They are finding that crop yields are highly variable at the different sites with some crops growing better closer to the city center and others producing higher yields in more rural areas. The effects of atmospheric conditions on crops appear to be important. Wortman and his colleagues have a two-fold goal for the project. First, they want to identify crops that grow well in any given urban environment. It may then be possible to develop new crops that are adapted to urban gardens and customized for the area. Also, urban conditions with higher temperatures, ozone, and carbon dioxide are similar to the changes expected elsewhere with climate change. Urban gardens, then, provide a natural laboratory for studying how these climatic and atmospheric changes will affect plants and crop yields in the future. "We're looking at it from a very practical perspective of providing recommendations for urban farmers, but it also has an angle of how these different crops respond to altered environments," says Wortman. Looking ahead, Wortman and his colleagues hope to further the development of urban agriculture by optimizing the ways in which crops and soils are managed in urban areas. Finding more efficient ways to produce food in cities will help control costs. Research to increase both the productivity and profitability of urban farming is necessary if fresh produce is to be available not just in high-end restaurants but to anyone looking for local food options.